The self catering unit offers a very spacious open plan design, with own kitchen and bathroom. Full DSTV is available to the unit. All the necessary utensils are provided in the kitchen, fitted undercounter oven and hob, microwave oven, fridge, kettle, toaster and all needed pots and pans. Bedding are provided and extra blankets are in the closet. The unit is presently fitted with a double and 2 x single beds and a sleeper couch. Arrangement for another single bed can be made. Breakfast and other meals can be provided on arrangement. 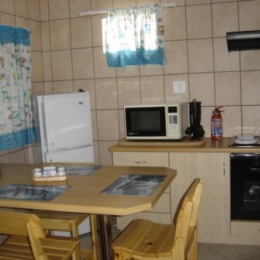 Loubser's B&B / Self Catering and Backpackers offer the tourist affordable accommodation in Walvis Bay, Namibia. We have 3 x Double Rooms, 1 x Self Catering unit and 2 x 4 Bed Dorm rooms available. Situated in the quiet lagoon area we are 350m from the lagoon, close to the yacht club, angling club, cricket oval and tennis courts. The shopping centers are within 1.7 km from the residence as well as restaurants and clubs. A full service will be available from us, accommodation, transfers to and from the airport, camping and accommodated tours to various destinations in Namibia and neighbouring countries. Day Tours along the central coastal area. We also cater for the vegetarian tourist at the B&B/Backpackers and on the camping tours of Namibia. Arrangement of various activities with operators can be done. Sandboarding, quadbiking, wind and kite surfing, paragliding, hiking trails, angling tours, etc are but a few of the activities that can be arranged. We want you to feel at home and enjoy true Namibian Hospitality. 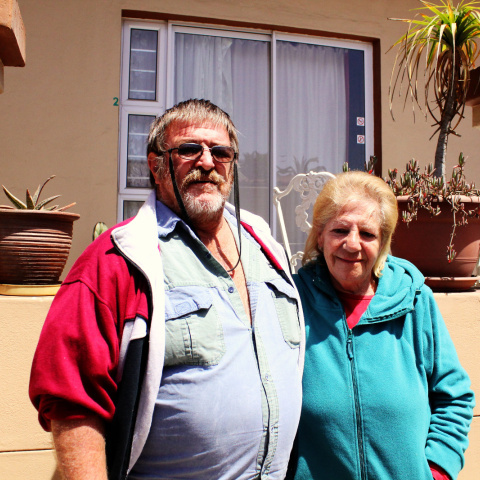 Lala and Francois Loubser invite you to come and stay with us.